3 Bedroom Semi Detached House For Sale in Sheffield for Guide Price £290,000. Blundells are pleased to market this attractively presented semi-detached family home with potential to extend (subject to consents), situated in the popular residential location of Greystones on an enviable corner position. The property boasts a prime location being only minutes away from the excellent and varied shops, restaurants and bars of Ecclesall Road and Sharrow Vale Road, benefitting from brilliant road and public transport links, nearby Bingham/Endcliffe parks and recreational grounds and a highly regarded school catchment. Comprising of three bedrooms, family bathroom, two reception rooms, kitchen and both front, side and rear gardens along with a side driveway providing off road parking with access to a garage. 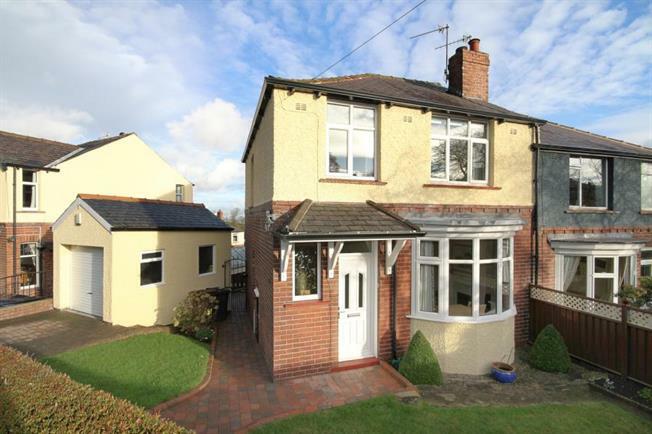 This well-proportioned family home really has to be viewed to be fully appreciated. The accommodation in brief comprises: entrance hallway, bay fronted dining room, rear facing lounge enjoying views from the rear over the garden, kitchen having a range of wall and base units with built in appliances to include gas hob, electric oven and extractor fan. First floor landing: master bedroom with front facing bay window and a range of built in wardrobes, double bedroom two having fabulous views to the rear, single bedroom three and family bathroom tiled with an attractive white suite which comprises of a low flush WC, wash hand basin and bath with mixer tap shower attachment and screen above. Externally the property enjoys a degree of privacy behind a well maintained hedged garden being mainly laid to lawn leading to the further side garden and block paved pathway, a block paved driveway provides off road parking leading to a garage with power and lighting whilst to the rear of the property is a low maintenance garden area.